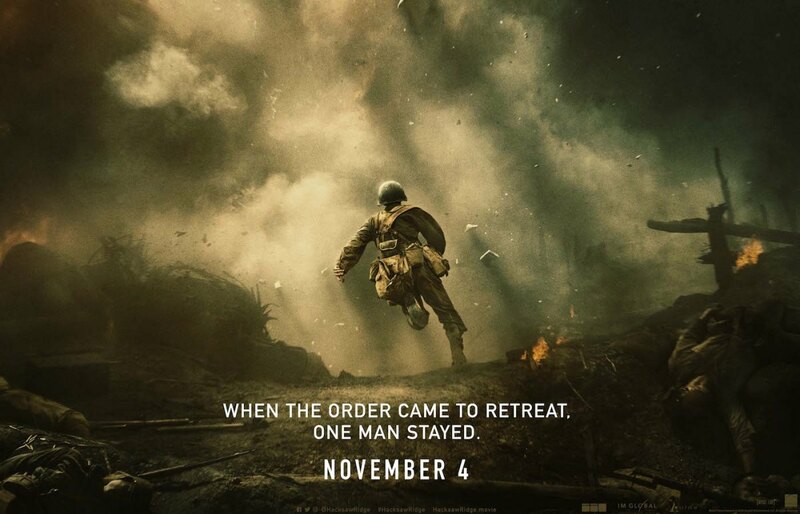 HACKSAW RIDGE is the true story of WWII hero Pfc. 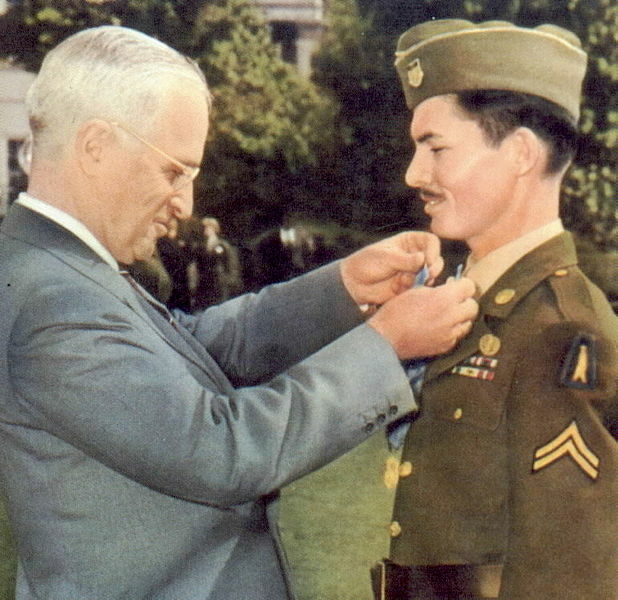 Desmond Doss, the first Conscientious Objector to earn the Medal of Honor. When Doss was drafted into the US Army during WWII, he chose to serve as a combat medic rather than go to a CO work camp, and he fought for the right to do so without carrying a weapon. During the Battle of Okinawa, the 1st Battalion assaulted a jagged escarpment. A bloody battle ensued, resulting in heavy casualties driving the Battalion back. Doss refused to seek cover. He carried seventy-five injured men off the fire-swept battlefield and lowered them down the ridge to friendly hands below. 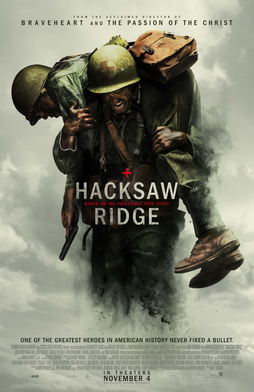 HACKSAW RIDGE tracks Doss’s life through his commitment as a Conscientious Objector, his fight to be allowed to serve in combat without bearing arms, and his heroic rescue of seventy-five fellow soldiers. The production quality of HACKSAW RIDGE is excellent, with award-worthy acting and cinematography. 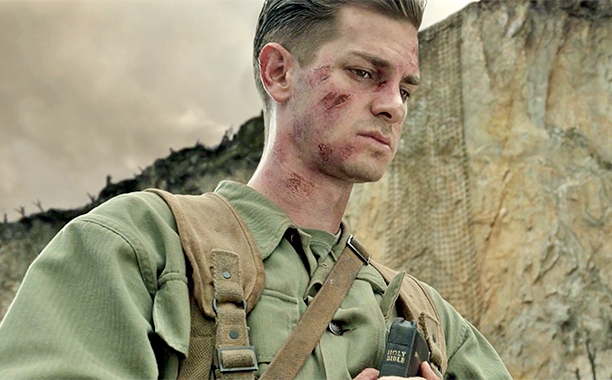 The talented Andrew Garfield is brilliant as Pfc. 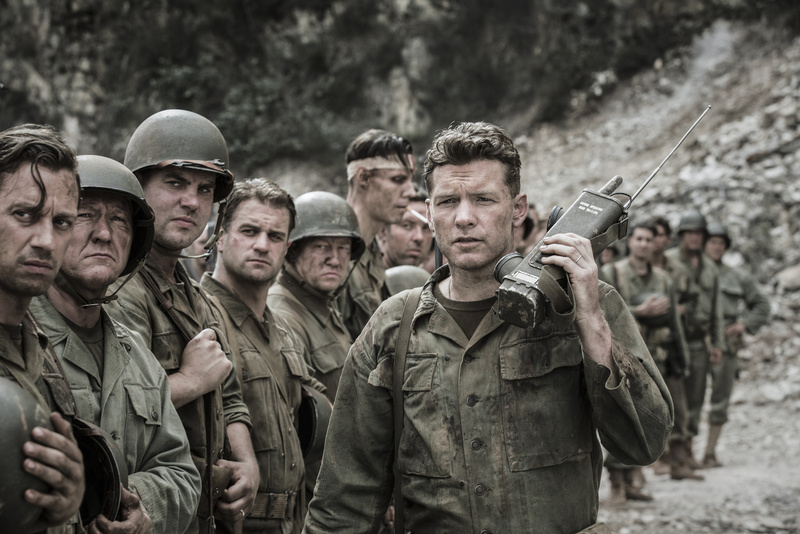 Desmond Doss, and Vince Vaughn, Sam Worthington, Luke Bracey, and Teresa Palmer are outstanding in their supporting roles. However, the movie is every bit as graphic, and then some, as you would expect from BRAVEHEART producer Mel Gibson. The “R” rating is well-deserved, and people under the age of 17 should not be admitted for good reason. I would also warn veterans about seeing this movie. It does not pull any punches in either the graphics or the audio, and it might be too intense for someone who has seen combat in real life. Doss pulling a man from the battlefield. HACKSAW RIDGE does an exceptional job presenting the conflicting-but-legitimate points of view of Doss, his fellow soldiers, and his officers. Pfc. Desmond Doss was a devout Seventh Day Adventist who refused to touch a firearm or work on Saturdays. The story ably traces how Doss’s religion and home atmosphere solidified his commitment to never touch a weapon while instilling in him a deep sense of duty to serve his country. His faith was inseparable from his character and is portrayed realistically as such in the movie. Equally realistic are the reactions of Doss’s fellow soldiers to his “red lines.” They were suspect of Doss’s religious devotion, wondering if he was actually simply a coward who would get them killed on the battlefield. Doss’s officers were concerned, as well, about sending a man into the field who refused to fight, and they wanted him out. 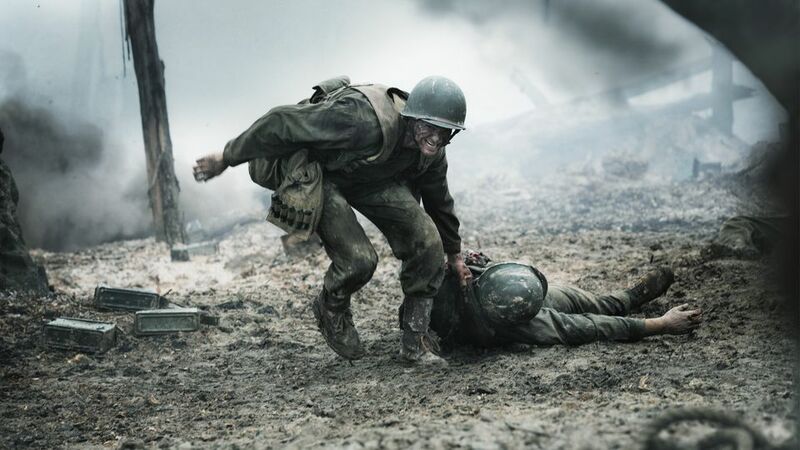 HACKSAW RIDGE gives a balanced and respectful presentation of the competing interests and motivations at work in the situation without over-dramatizing or unrealistically vilifying any of the men involved. On the contrary, Doss was a deeply religious man, and religious beliefs were the foundation of his heroism in real life. The movie simply portrays him as such. As for the accusations of “pornographic violence,” I would invite those reviewers to do a tour or two in combat and then get back to us. Regarding the label “war propaganda,” a true tale truly told is not propaganda. 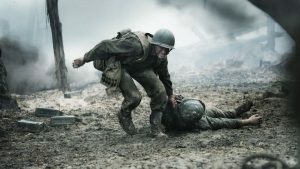 HACKSAW RIDGE is true to Desmond Doss’s amazing life story with little dramatic embellishment. 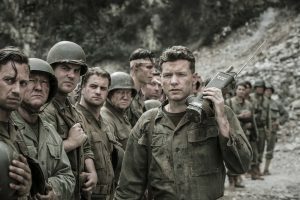 Interviews with Doss, his captain, and with soldiers who knew him at the end of the movie confirm the events and the characters as factual. Waiting for Doss to finish his prayers. In fact, the movie HACKSAW RIDGE is not big enough to portray all of Doss’s heroic deeds. For example, the film shows cargo nets hung from the top of the ridge. What it doesn’t show is that Doss was one of the three men to carry the massive cargo nets up the ridge and mount them there under the nose of the Japanese. (See article below, History vs. Hollywood, for historical picture of Doss with the nets at the top of the ridge.) After the battle wherein Doss brought down all seventy-five casualties on his own, he continued to assist wounded soldiers and to inspire the men in the 1st Battalion to go on to win a foothold on the ridge, even after being wounded by shrapnel and sniper fire. It’s worth reading the full text of his Medal of Honor citation below. Check out those cargo nets on that 400 ft. ridge. In summary, this is a true story well told about a man of faith, whose faith gave him strength to rescue over seventy-five men from the battlefield during one of the bloodiest conflicts of WWII. Those offended by displays of Christian faith or the horrors of war might find this movie is not for them. I would encourage those people to be open-minded and accepting of diversity and go anyway to learn about genuine historical events and a very real man who deserves an excellent movie. Those who are comfortable with religious conviction and who understand that war is hell will be amazed at the story of war hero Desmond Doss. I give HACKSAW RIDGE our highest Bayard & Holmes rating, a .44 magnum, with one caveat. Though the violence is realistic, it is extreme, just as one might expect the Battle of Okinawa to be. With excellent production and outstanding acting, it’s worth paying the prime time price for if you can stand the crowd. For more about Pfc. Desmond Doss and how HACKSAW RIDGE compares to Doss’s real life, see HistoryvsHollywood.com Hacksaw Ridge and Bayard & Holmes article, The Medal of Honor Recipient Who Wouldn’t Fight.